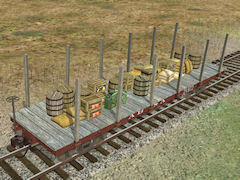 Rolling stock from (mostly) the latter part of the 19th century. Click on the screenshot to download from the Auran DLS. Scroll down to browse, or click on the road name below to jump to that section. 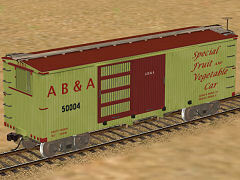 Virginia and Truckee rolling stock now has its own page. Built by Baldwin in 1906, #27936, as 1604. It was renumbered 69 and again renumbered 104. 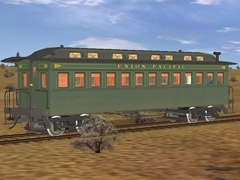 It later was sold to the Columbus & Greenville as 404. 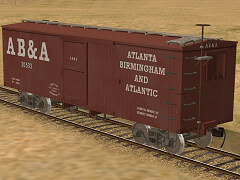 In 1926, the Atlanta, Birmingham, & Coast replaced the AB&A. This model is from that time. Created by Ben Neal (bdaneal); links take you to his site, Subpar Productions. Also requires his common files and shortline cab. Another Baldwin that served on the AB&C, these two are the closest I've found to any AB&A locomotives. Updated Oct 2014 - Converted to Blender; fixed some minor errors; improved / optimized the model and textures; added a normal map; and improved the shadow. 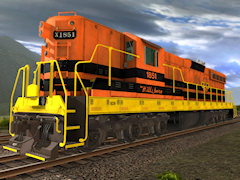 Updated Oct 2014: Converted to Blender; added normal maps; fixed minor errors; improved textures and shadow; improved marker light script. 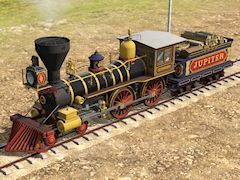 Built by Schenectady Locomotive Works in New York in 1868, Jupiter (and her 3 sister locomotives Storm, Whirlwind, and Leviathan) was taken around Cape Horn by ship to California, where she was reassembled and put to work constructing the Central Pacific Railroad. Just two short months later, Jupiter was the CP's representative at the golden spike ceremony at Promontory Summit. 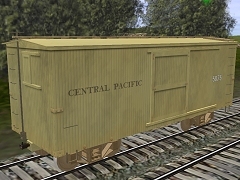 Central Pacific Nos. 18 (2nd) and 19 (2nd); as built. 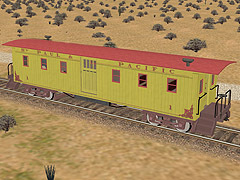 Built in the Central Pacific shops ca 1880s?. 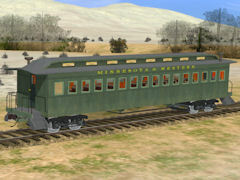 A model of a series of water cars first built in February 1869. 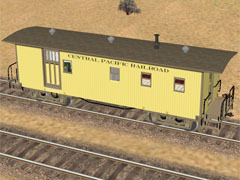 A model of a late 1860's 30' CP platform car, with flat iron trusses and captured end beams on rigid archbar trucks. 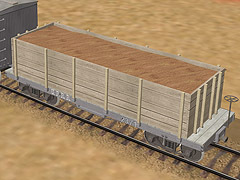 A second model with slightly different textures is also available. Thanks to Andrew Brandon for paint and lettering assistance. Complete rebuilt Febuary 2019 with more detail and PBR textures. 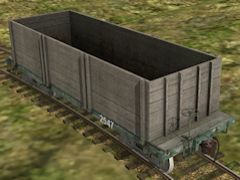 A model of a 25' CP box car on rigid archbar trucks. 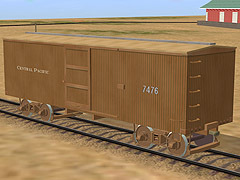 These boxcars were built around 1866. 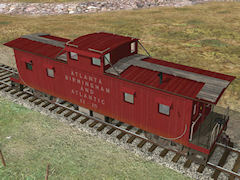 A second model with slightly different textures and numbering is also available. Carries old west general goods, hay, oranges, and cattle. 3 levels of LoD; ARN, and random texture switching to add variety to a string of cars. Thanks to Wulf and Andi for help with the scripting! Obsolete: I haven't actually found any evidince of 24' flats on the CP. 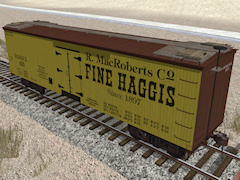 I may end up replacing these models with 'newer' (1873) 30' flats. 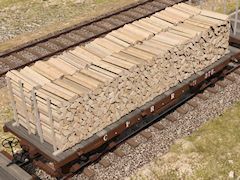 12 ton load capacity; carries old west general goods. 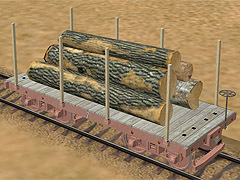 Interactive load support with interior; doors open to load and unload product. Also includes ARN support for random road numbers. 10 tons unloaded; 20 ton capacity. Two levels of detail; 2468 / 114 polygons. Uses the ARN Sysytem for unique running numbers. 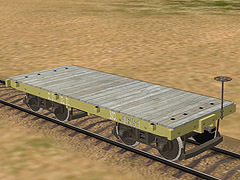 Basically some planks attached to a flat car. 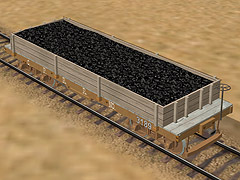 Set up for bulk loads and texture replacement; the default load is coal. 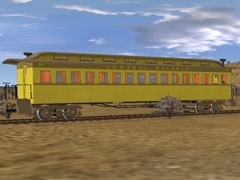 Passenger interactive; carries Western Passengers (36 max). 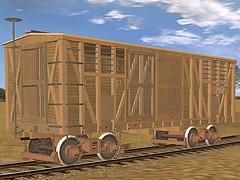 Rudimentary air brakes; hook and link couplers. 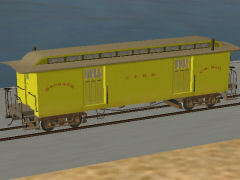 Animated doors during passenger loading / unloading; lighted interior at night. 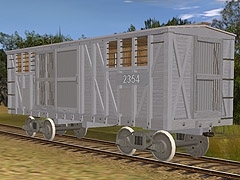 Industry interactive; carries baggage and mail products; with operating doors. 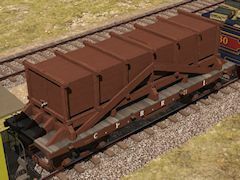 Rudimentary air brakes; hook and link couplers. Industry interactive and LARS compatible; carries Express product. 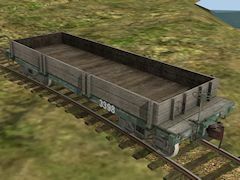 Animated doors during loading and unloading. Pre-cupola era. Carries 15 Western Passengers, as was the norm at that time. Features animated doors and a lit interior after dark. 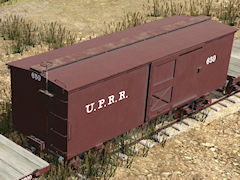 Based on Ben Neal's undecorated SD9 model; available from Subpar Productions. 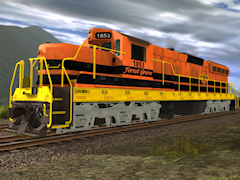 Updated April 2015 to fix lights and add minor optimizations / corrections. Built in 1868 by Rogers Locomotive and Machine Works in Patterson, NJ. Carries old west general goods, hay, oranges, and cattle. 3 levels of LoD; ARN, and random texture switching to add variety to a string of cars. Thanks to Wulf and Andi for help with the scripting! 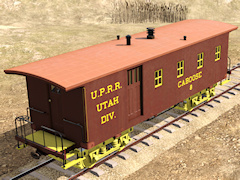 A 30' platform (flat) car used by Union Pacific in the late 1860s. Has a captured end sill, and rides on rigid archbar trucks. 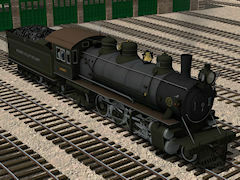 A second model with slightly different textures is also available. 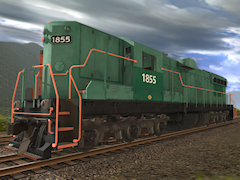 Complete rebuild January 2019 with higher-detail model, PBR textures, and more accurate paint colors. Pre-cupola era. Carries 20 Western Passengers, as was the norm at that time. Features animated doors and a lit interior after dark. 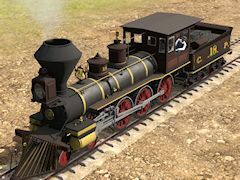 The General is an American 4-4-0 Steam Locomotive that was made famous in a daring raid from the North during the American Civil war of 1861-1865. 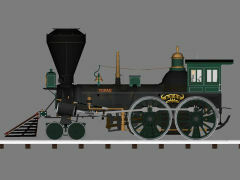 This model is a recreation of the Civil War -era engine and tender, from 1855 to 1864. A matching tender is also available. Created by Terry Bryson (tbryson2). 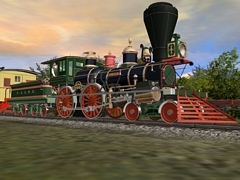 The Texas is an American 4-4-0 Steam Locomotive that was made famous in a daring raid from the North during the American Civil war of 1861-1865. 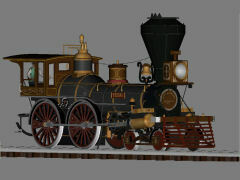 This model is a recreation of the Civil War -era engine and tender, from 1855 to 1864. 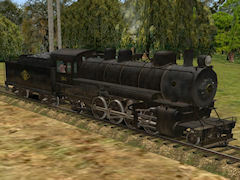 The Yonah is an American 4-4-0 Steam Locomotive that was involved in a daring raid from the North during the American Civil war of 1861-1865. 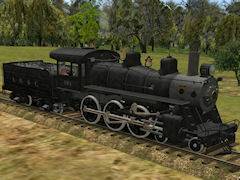 This model is a recreation of the Civil War -era engine and tender, from 1855 to 1864. 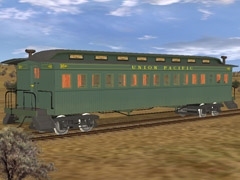 Passenger interactive; carries Western Passengers (44 max). Hand brakes only; hook and link couplers. 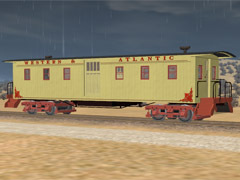 Animated doors during passenger loading / unloading; lighted interior at night. Updated July 13th 2009 to fix an issue with the nightmode. Passenger compartment accepts Western Passengers (12 max) and baggage compartment accepts baggage product. 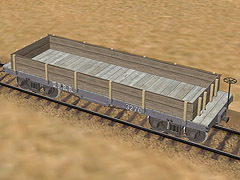 Hand brakes; hook and link couplers. 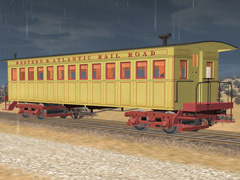 Animated doors during passenger loading / unloading; dimly lit interior at night. GMAX is the same as the St. Paul & Pacific combine above. 1902 Frisco-built American Standard. 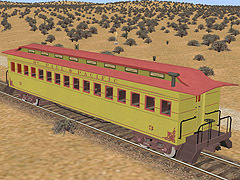 #21 was delivered by her Frisco engineer, C. H. Grant, to the Yosemite Valley when they bought her secondhand, and was told to take her up the valley on her first train as she'd not yet been assigned a crew. C. H. Grant loved his engine and its new home so much, he decided to stay, and crewed the #21 until his retirement in 1926. #21 never happily found another engineer, and in 1928, the year of Grant's death, she was put in a siding at El Portal, never to move under her own steam again. In 1946 she was dragged down to Merced and scrapped. 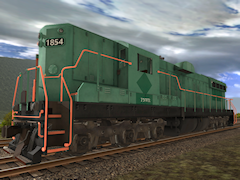 Created by Trainboi1 and hosted by Trainz-Forge. 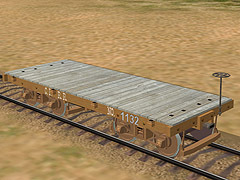 1907 ALCo. American Standard type. 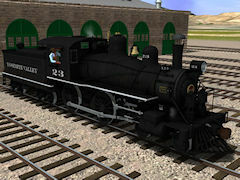 Was given front-mounted air compressors and unique spark arrestor by the YVRR, and pulled the line's passenger service almost exclusively in the later years. She also pulled the last train of lead into Merced. 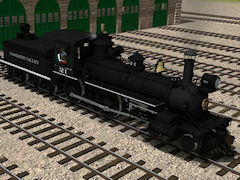 The Pleistocene class of locomotives are a series of 2-8-2's built in 1922 by the Baldwin Locomotive Works. 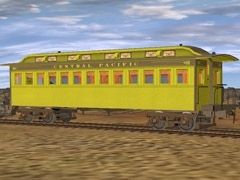 The Pleistocene class was a standard class of mixed-traffic locomotive, capable of hauling loads across desert Nevada at speeds up to 50mph. As a result, the class proved highly popular. Each is named after some pertinent Pleistocene landform or fauna that roamed the wilds of Nevada in the last ice age. 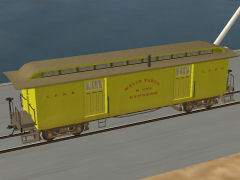 Built by Trainboi1 and hosted by Trainz-Forge. Updated Dec 7, 2012 to fix a minor config error. 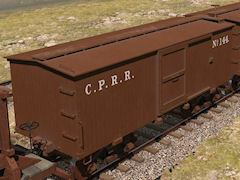 This represents an older (1870's) coach, upgraded with knuckle couplers and air brakes to serve into the 20th century. Fictional roadname; by request. 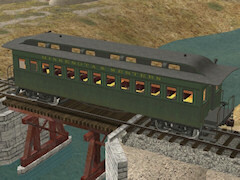 Passenger interactive; suports Western Passengers (34 max). 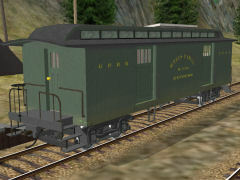 Animated doors during passenger loading / unloading; lighted interior at night. Three levels of detail; 4357 / 2808 / 44 polygons. 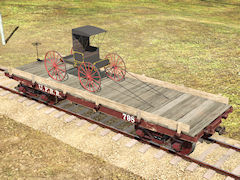 This represents another older (1870's) coach, upgraded with knuckle couplers and air brakes to serve into the 20th century. Passenger interactive; suports Western Passengers (34 max). 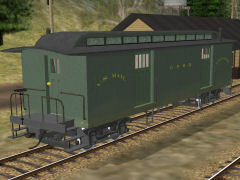 Animated doors during passenger loading / unloading; lighted interior at night. Three levels of detail; 5572 / 3016 / 50 polygons. 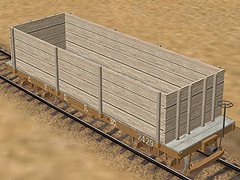 A simple wood undecorated flatcar perfect for small standard-gauge logging railroads. 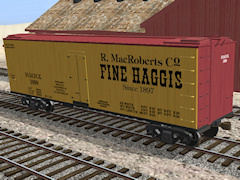 Find several standard-gauge logging locomotives at Sir Gibby's site; here. 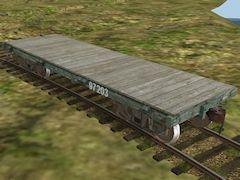 This model represents an old wooden flat car, upgraded with 'modern' safety equipment. 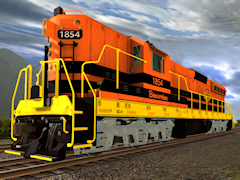 Updated Dec 2014 - added detail, better textures, normal maps, and fixed a minor config error. This model represents an old wooden gondola, upgraded with 'modern' safety equipment.